[Private Press; Manuscript] Francis James Publishing Co. | Purchases Book, "Dissection Book", Sales Book, and a notebook with Purchases and Receipts..
F. J. Newbery [Francis James Newbery (b.1881)], sometime with the Golden Cockerel Press and director and manager of the Chiswick Press, here Publisher as "Francis James Publishoing Co.
All in Francis James Newbery's hand. Four volumes, sm. folio (3), 8vo (Notebook), good condition. [Purchases Book] c.32pp. used; [Dissection Book] c.14pp. used; Sales Book. 18pp. used; Notebook, 16pp total - Payments 10pp, Receipts, 6pp.A. PURCHASES BOOK: Sources of various items (usually multiple) with costs include: George Bell & Sons (permit to use illustration); Craske, Vaus & Crampton (Fine line blocks); Chiswick Press (colour printing etc; many references); National News Letter (cartridge paper); Novello & Co. (Binding - 3017 copies of 'Easter Eggs'); H.H. The collection is in good condition, lightly aged and worn, apart from Item Seven. 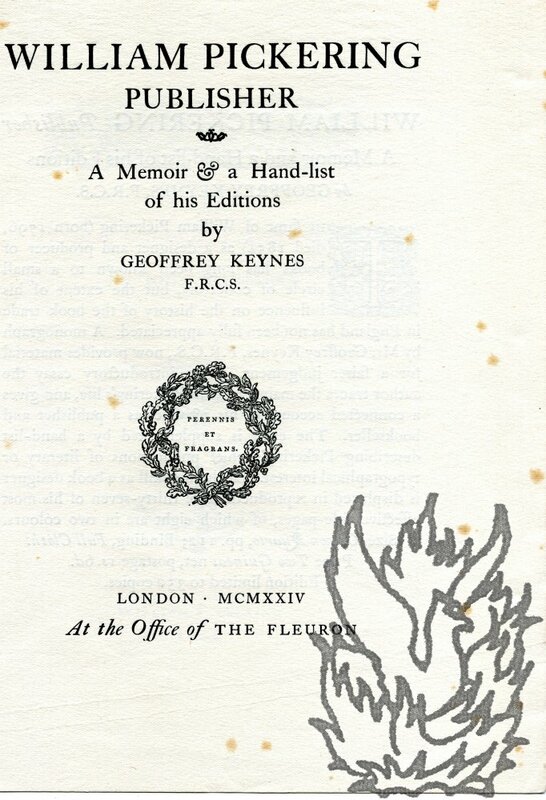 ONE: Autograph notes by Newberry on the firms of 'Chiswick Press Tooks Court' and 'Wm. Griggs & Sons Ltd. Peckham'. 4pp., 12mo. Closely written, with corrections. The first section concludes: 'Jacobi was certainly an experienced and successful printer of fine printed volumes and H.M. paper. William Morris drew inspiration from Chiswick Press that led to his founding the Kelmscott Press. His first experiments in the use of type designed at K. P. were carried out under Jacobi. C. P.
7 + 10 pp., folio. Stitched and unbound. Printed front wrap, with vignette and 'St. Thomas's Hospital | Royal Charter.' in black letter. Worn and aged, with heavily-worn front wrap detached. Each of the two sections has its own drophead title, and printers' slug on last page. Tastefully printed on thick paper, with vignettes above the two drophead titles. All text in Latin. Scarce: no copy in the British Library or on COPAC. Whittingham and Wilkins were active in Tooks Court in the 1860s. London: Printed for John Sharpe, Duke Street, Piccadilly; by C. and C. Whittingham, Chiswick. 1825. 12mo, 220 pp. Engraved title and six other plates, each carrying an engraving from Westall. 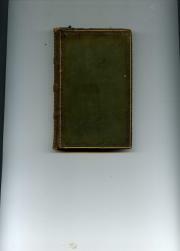 In green calf binding, gilt, with spine in compartments. Marbled edges and endpapers. Internally tight, on lightly-aged paper, with the plates a little foxed. Rebacked and in worn and lightly-stained binding. Tasteful small bookplate, with the single word 'Simpson' in copperplate, an initial 'M.' added in manuscript. Pink ticket on front pastedown: 'GEORGE DAVEY, | Bookseller, Binder, | & STATIONER, | NO. 1 BROAD STREET, | BRISTOL.' An uncommon Chiswick Press item. Ecce Mundus. Industrial Ideals and the Book Beautiful. 8vo:  pp (unpaginated). In original quarter binding, with buff boards and vellum spine on which is stamped in black 'ECCE MUNDUS'. Good copy: internally tight and clean, in slightly-grubby and worn binding bumped at foot of spine and at one corner. Presentation copy, with autograph inscription by Cobden-Sanderson on the front free endpaper: 'To Mr. Wheatley [the bibliographer Henry Benjamin Wheatley] with the compliments of the writer'. 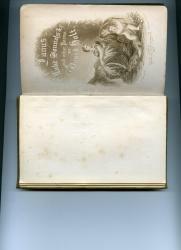 With green leather and gilt bookplate of Alfred Sutro on front pastedown. Elizabeth: or, The Exiles of Siberia. Translated from the French of Madame Cottin. Chiswick: From the Press of C. Whittingham, College House. Sold by R. Jennings, Poultry; T. Tegg, Cheapside; A. K. Newman and Co. Leadenhall Street; London: J. Sutherland, Edinburgh; and Richard Griffin and Co. Glasgow. 1822. 12mo: 123 + [iv] pp. Engraved title (dated 'Octr. 1823') featuring engraving Heath from design by Corbould. Four pages of publisher's advertisements at rear. 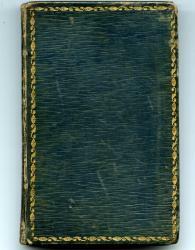 In contemporary green leather binding with decorative gilt spine and pattern to edges of boards, marbled endpapers and marbling to edges. Contemporary ownership inscription of 'Miss L. Smith'. 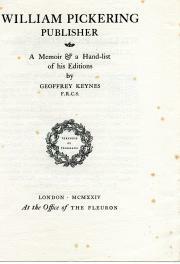 A tight, sound copy, on lightly-aged paper, with light staining to engraved title, and wear to binding. COPAC only lists copies of this edition at Durham, St Andrews, Oxford and the British Library. Janus, Lake Sonnets, etc. and other Poems. 12mo: viii + 207 pp. Advertisement and printer's slug on reverse of last leaf. Additional sepia engraved title ('T. Letherbrow. Del. W. Morton. Sc. Manchr.') with illustration depicting a stern-looking woman (one of the fates?) holding a bobbin of thread. By her side a cherub with a lyre and a large, incongruous metal cog. In original blind-stamped green cloth binding. A tight copy, lightly foxed and aged, in faded binding with slight wear and a small stain to the front board. Ownership stamp of Florence Armaghdale on front free endpaper. Last two leaves opened clumsily. Scarce. Quarto (25.5 x 19 cm) bifolium. Attractively-printed on watermarked laid paper. Unbound. Foxed and lightly-creased. Two short 0.5 cm buff strips of cloth from mount neatly adhering to the margin of the reverse of the second leaf. 'PERENNIS ET FRAGRANS.' enclosed within engraved wreath on title. Eighteen-line prospectus for the work on reverse of first leaf, with the recto of the second carrying a full-page facsimile of the title of Pickering's 1844 edition of John Merbecke's 1550 'The Book of Common Prayer Noted', printed in red and black. Printer's slug on reverse of second leaf. 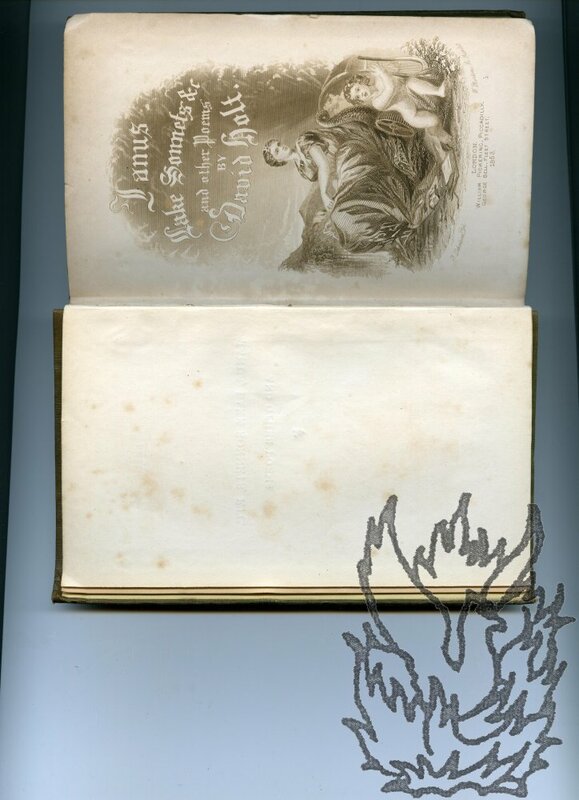 Catalogue of Books, Manuscripts, Autographs and Drawings. Quarto: 65 pp. Numerous plates. In original grey printed wraps. Internally good, with a little spotting and creasing to the ruckled edges; wraps worn and stained. A beautifully printed item, on thick laid paper. Among the printed matter are books of hours, breviaries, psalters, and letters (with facsimile plates) by Byron, Keats, Johnson and Sterne; and manuscripts of Fielding and Horace Walpole. No. 3. Important and Precious Autographs and Authors' Original MSS. from Froissart (1338 to 1404) to Clemenceau. Over five Centuries. Octavo: ii + 174 pp. Stitched. In original grey printed wraps. Internally clean and tight, in grubby and worn wraps. A first class catalogue, with excellent entries on items including letters and documents by Byron, Carlyle, Dickens, Disraeli, Edward Fitzgerald, Garibaldi, Pitt the Younger, Sir Walter Scott, Tennyson, Horace Walpole, George Washington. Fifteen books from the library of Mrs Piozzi. English Composition, in a Method entirely new, with various short Contrasted Examples, from Celebrated Writers, the whole adapted to Common Capacities, [...] To which are added, [...] a List of Select Books for English Readers with Remarks. London: Printed by C. Whittingham, Dean Street, Fetter Lane. For H. D. Symonds, Paternoster-Row, And may be had of Mr. Seeley, Bookseller in Buckingham. 1802. 12mo: xxxv + 177 pp + three pages of advertisements. Portrait frontispiece. Good, on aged paper. In remains of contemporary calf binding, rebacked with new spine label. Bookplate of Ralph Lindsay, with his signature, dated 15 July 1811, on title-page. Modern ownership inscription on reverse of frontispiece. The first advertisement is for 'Buckingham Boarding School for Young Gentlemen' ('The Rev. G. G. SCRAGGS takes Boarders at Eighteen Guineas per Annum, (Washing excluded) [...] Mr. SCRAGGS has been above 16 years engaged in teaching youth. [...]').